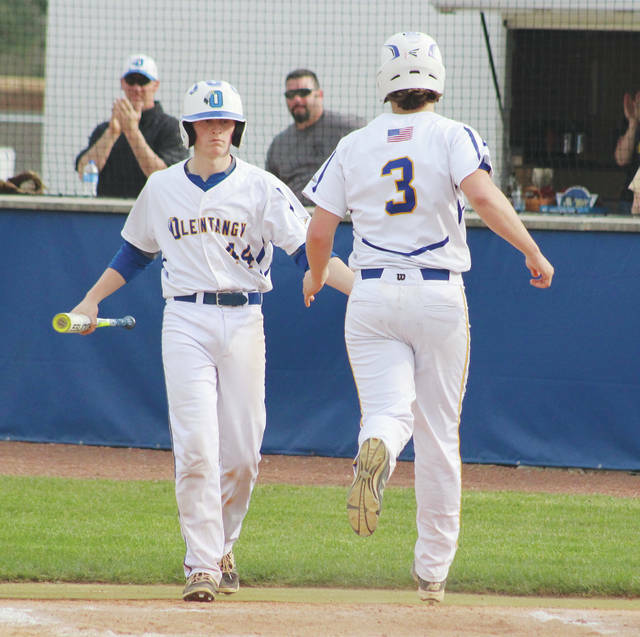 Olentangy’s Lucas Hassinger congratulates Connor Haag (3) after Haag scored a run during a game earlier this season. The Braves won their second Division I district title in the last three years with a 5-4 win over Hilliard Darby Wednesday in Dublin. Cole Robinson’s two-out, two-run double broke a 3-3 tie in the top of the seventh and Caden Kaiser navigated through a pressure-packed bottom half to pick up the complete-game win on the mound as the Olentangy baseball team outlasted Hilliard Darby 5-4 in Wednesday’s Division I district championship in Dublin. It was the ninth-seeded Braves’ second district title in three years. “Caden was all heart on the mound,” Olentangy coach Ryan Lucas said. “He was in a great groove and competed like a three-year varsity guy should. He is usually the best player on the field and today was no different. Lucas Hassinger and Braydon Chitty drew walks to set the table in the seventh. Kaiser flew out to center for the second out of the inning before Robinson’s clutch hit turned a tie game into a 5-3 Olentangy edge. A sacrifice bunt off the bat of Brice Stultz helped the second-seeded Panthers get the tying runs in scoring position with one out in the seventh, but Kaiser was able to get the final two outs to seal the deal. Darby’s Ben Gbur hit a sac fly before Tim Hales grounded out to third to end the game. Kaiser allowed four runs (three earned) on six hits while walking a pair over his seven innings of work. Connor Haag led the Braves at the plate, finishing 2-for-3 with a run and an RBI. Stacey Walters hit a homer to break a sixth-inning tie, then tossed a 1-2-3 seventh to lead the Big Walnut softball team to a thrilling 7-6 win over Highland in a Division II district semifinal Wednesday in Pickerington. The fifth-seeded Golden Eagles started fast, taking a 1-0 lead over the fourth-seeded Fighting Scots when Hailey Krinn, the first batter of the game, hit a homer over the center field fence. BW added to the early edge later in the first, making it 2-0 when Molly Sharpe doubled home Karley Becker. Highland answered with two runs of its own in the bottom of the first, but Big Walnut used a four-run fourth — an inning punctuated by a two-run homer off the bat of Sharpe — to regain control. The Scots clawed back into things, getting back to even with two runs in the fourth and another pair in the sixth, but Walters’ blast in the seventh proved to be the difference. Walters finished 3-for-4 with three RBI and a run scored at the plate. She also picked up the complete-game win in the circle, allowing six runs (four earned) on seven hits while striking out two and walking six. Sharp and Krinn were also solid, finishing with two hits apiece. Krinn added an RBI and two runs scored while Sharpe had three RBI and a run scored. Next up, BW will take on second-seeded Jonathan Alder in a district final at Pickerington Central Friday at 5 p.m.